Click Money System by Julia and Harold claims to make more than $10,000 a day for its users, but my readers who signed up for it lost all their deposits. In reality, none of the real members of Click Money scam actually made money with it. While it’s true that the internet is full of opportunities, we can’t deny that it’s lurking with scams, too. For every legitimate program, there are a dozen frauds waiting to take your money. Unfortunately, Click Money System belongs to the latter. It has all the characteristics of an online scam, and the abysmal trading results of their members confirmed our findings. This email was sent by one of my readers who unfortunately signed up for Click Money System scam. She lost all her deposits within 24 hours, and only 2 out of 11 trades made by the system resulted in profits. What is Click Money All About? Click Money is a generic binary trading software that is designed to trade binary options on your behalf. Binary options is an extremely risky trade instrument because it behaves like traditional gambling. To start trading binary options, you need to have a broker account. When you sign up for Click Money software through their website, you are actually registering for a trading account with their partnered brokers. As mentioned in their sales video, you need to fund your trading account with at least $250 to activate Click Money software. Once you activate the software, Click Money will place trades for you automatically, but most of these will be losing trades. The system is designed to favor the brokers, where the risk to reward ratio is heavily biased against the traders. This is why the software yielded 9 losses out of 11 trades. Each trade requires you to risk a minimum of $25, so you can at most take 10 consecutive losses before losing your entire trading balance. However, a winning trade doesn’t translate into $25 profits. You can only win a maximum of $15 to $20 while risking $25 for each trade. Assuming you win half the trades, you’ll still lose money in the long run. This is why the vast majority of binary options trades lose all their deposits within hours of activating the trading software. These losses are pocketed by the broker, which is then shared with the scammers behind Click Money system. Even though you don’t pay a cent to use the software, the scammers actually make money from you through the trading deposit. The purpose of Click Money sales video is to persuade you to deposit money with their partnered brokers using fake stories. This is how they make money off you. On the bright side, you don’t have to pay a hefty deposit to find out the truth behind Click Money scam. Here’s some scam tactics that appeared in their sales page, keep a lookout and you’ll be able to avoid similar scams in the future. Note: If you are really determined to learn making money online, here’s a 4,000 words guide that explains how I profit from the internet. Read through it and get started the right way. In the sales video, Julia and Harold supposedly showed their members how to setup their trading accounts and profit in just a matter of minutes. However, before they started trading, there were already 9874 lost trades on that account (refer to screenshot above). This is a red flag because a brand new account shouldn’t have any trading records on it. As the software allegedly made profits, the number of won trades increased to 136 while the number of lost trades remain the same. However, take a look at the open trades below the numbers. They are essentially the same BEFORE and AFTER the profits, with the same assets and expiring time. In other words, no trade has been generated in between these screenshots. 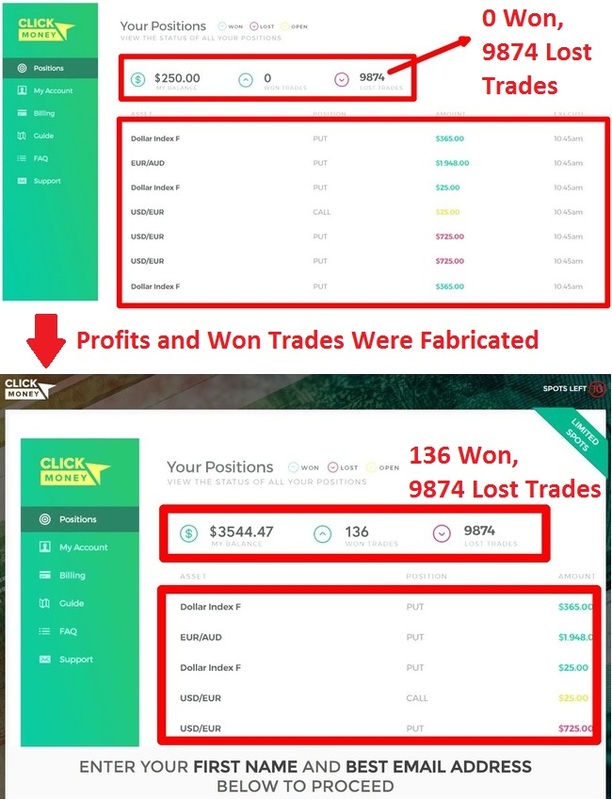 In reality, the scammers took the initial screenshot and photoshopped a much higher number of won trades (from 0 to 136) and trading balance (from $250 to $3544.47). There were no real trades behind the numbers. Every single person you saw in the sales video, including Julia and Harold were actors hired to promote the scam. It was in their scripts to act surprised at the fake profits shown in the video. Did You Read Their Disclaimer? It’s always important to read the terms and conditions of a product, because it’s the only document that holds true legal power. If you want to sue them over your losses, your attorney will look into the disclaimer, not what Click Money has promised in their sales video. You can’t find the document anywhere within their sales material, because it’s supposed to be hidden from you. It can only be found through a fine print at the bottom of their sales page that reads “Earnings Disclaimer”. I’ve underlined the important terms in red. In summary, the scammers behind Click Money admits that their software doesn’t make guaranteed profits. In fact, you are most likely to lose all your trading deposits. All the profits shown in the sales video are intended to express their OPINION of earnings potential. In other words, none of the profits shown are real! CLICK MONEY IS A SCAM. I strongly advise you to stay away from the scam if you don’t want to lose your hard-earned money. It’s better to spend that $250 deposit for a nice dinner with your family than wasting it on a scam like this. Have you encountered any online scams? I’ve fallen for a few before coming across the legitimate one, so let us know in the comments below if you have any personal experience to share! I also lost a couple of hundred bucks to it! Now I have about $30 left in the account and they won’t let me withdraw! They say I haven’t performed minimum number of trades! What is that about?? Hi Connie, most likely you have received trading bonus and are bound to their minimum trades condition. In this case, you have no choice but to perform the minimum number of trades before you can withdraw the remaining funds.